Quince blooms are the first signs of spring in our area and light up the landscape with their hot pink color. I painted “Spring” on a cold and rainy morning, with thoughts of warmer weather and days outside on my mind. 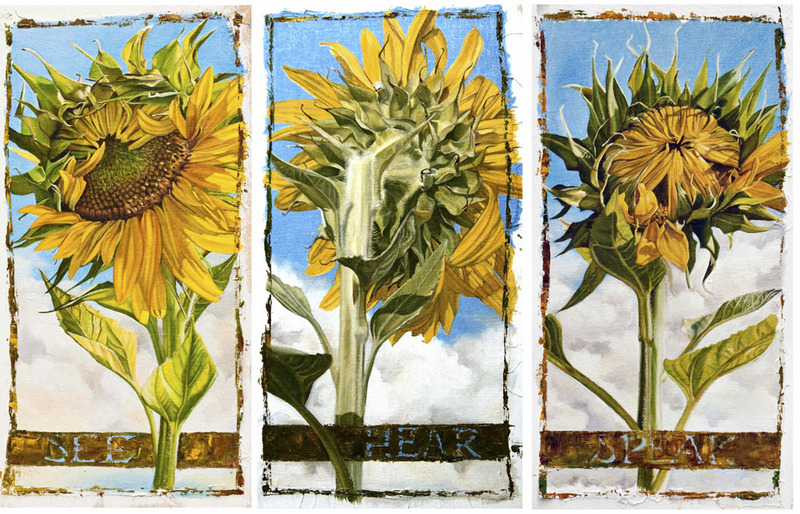 I have always planted sunflowers in our yard, and then I started drawing and painting them. I realized how human they seemed, and at various stages of blooming, saw the See No Evil aspect of them. After some thought I put the idea down on canvas, and had a lot of fun with it. The luminescence of flowers is wondrous. It is often hard to capture while at the same time easy in its abstract simplicity. It is critical that the essence of what makes the flower so beautiful comes through. I tried to achieve that here. 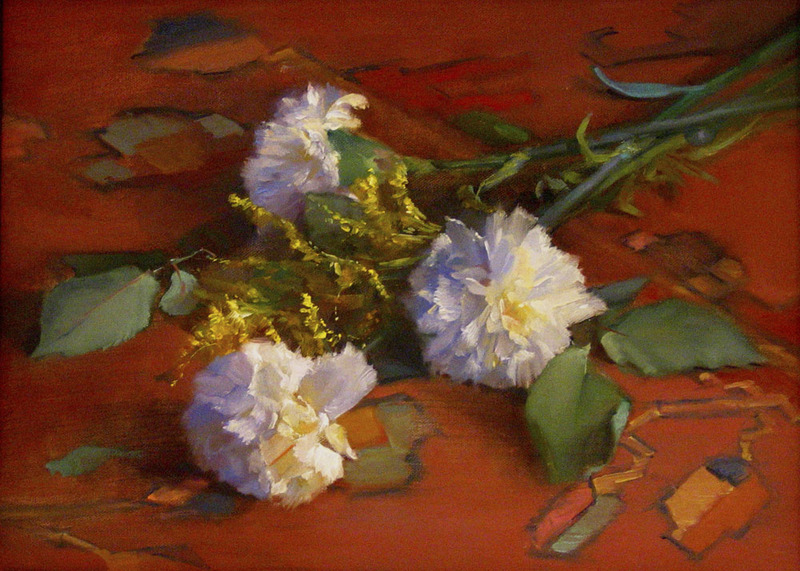 Until this painting, I was not a fan of carnations, but I found few options in early spring and decided to paint these white carnations. What a surprise to find their true beauty only by painting them. There is nothing like observing them for hours to find they are absolutely gorgeous. I’m a convert. I love the way the light bounces off of the white petals. The shadows of blue and purple are brilliant contrasts to the lights and hot center of the flower. The most fantastic part of any flower, however, has to be when light passes through translucent petals. It is indescribable by words, but hopefully not by paint brush. I call this a prophetic painting. Irondale is a thriving community in Birmingham, Alabama. While on my way to have lunch there, I noticed sunflowers in the edge of a garden. Down the road from Irondale is Woodlawn. It once had been a nice quiet neighborhood, but over the decades it has been taken over by drug dealers, crime, and prostitution. Our church has partnered with inner-city churches to make a difference in the area. Dr. Robert Record had a dream of opening a medical facility where people without income could get free medical and dental care as well as counseling. Last year that dream came true for him and many others when The Dream Center opened its doors. Job fairs are taking place and crime rates are going down. The local school, houses, and apartments are being refurbished. Prayer is taking place in buildings occupied by drug dealers. I was in the neighborhood one day when I saw the afternoon light sifting across this house. There were the remnants of a garden now overgrown with weeds. I immediately thought of the sunflowers I had seen the week before. Isaiah 61 says we will have a double portion instead of shame. 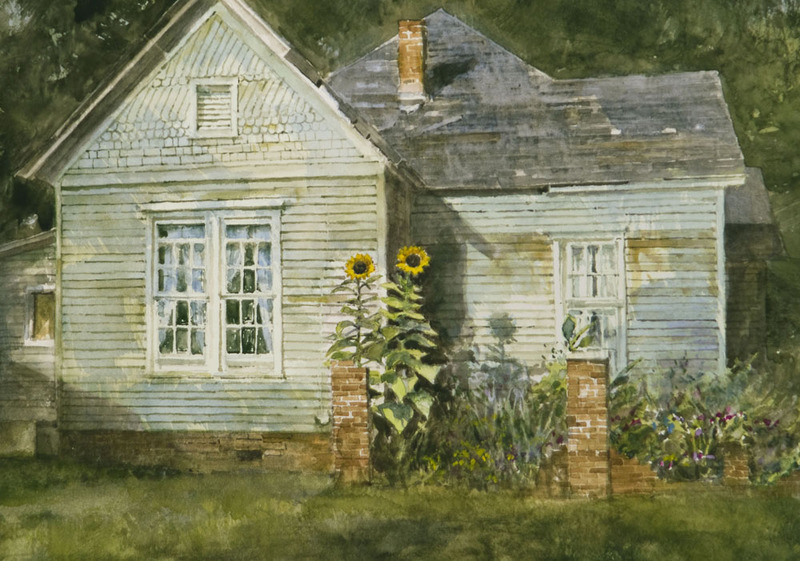 The two sunflowers emerging from the decay is a picture of Hope Blooming in Woodlawn, Alabama. 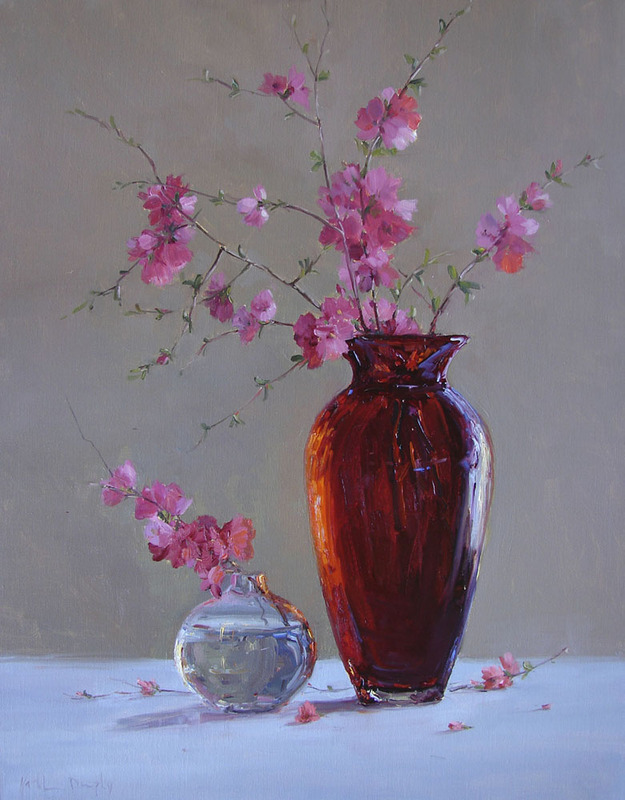 Botanical subjects suggest to me a wealth of variety in form, line, and color – in essence a world in microcosm. 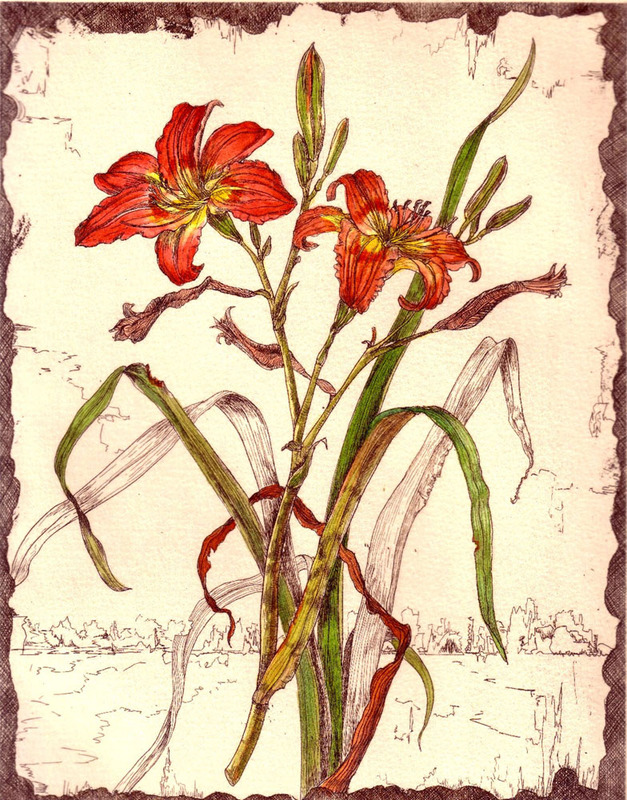 The architecture of plants and patterns in nature presents a complex array of what I refer to as “environmental calligraphy.” Daylilies migrated to the United States after a long journey from China along the Silk Road and through Europe, surely a hieroglyph for history. In my garden, they defy the weather and neglect from year to year. I see in the daylilies a universal symbol of beauty, grace, and strength. In composing the “Daylily” etching, I wanted to capture in the leaves and stems the movement of a dancer. I set the flower in an antiqued, abstract landscape, and then completed the image by painting the daylily’s rich warm colors.